If you’re wondering about the efficiency and compliance of your procurement card system, you’ve come to the right place. 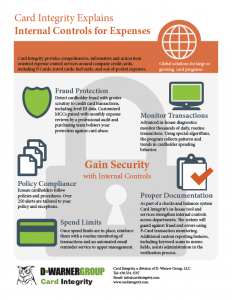 Card Integrity focuses on offering you the solutions you need to make it a success. No matter what your company’s industry is or where your company is located in the world, Card Integrity has solutions to improve the success of your card programs. You can learn more about our solutions and how they work together to help your card programs become more successful by going to our Solutions page on this website. At Card Integrity, we believe that your success is our success – and the way we help you be successful is through our solutions. Using our proprietary tools, experienced professionals, quality service, and customer focus, Card Integrity has developed solutions with an emphasis on saving money, managing risk, and building awareness with both cardholders and stakeholders. Card Integrity offers these multiple, comprehensive solutions in an integrated manner that is unique to our industry. For you, that means our solutions work together in your system to support your policies and procedures, while ensuring compliance through expense monitoring and cardholder training. Card Integrity’s “software as a service” (SaaS) approach to our solutions bolts onto your existing card programs without the need to change banks or providers. D. Warner Group is a global, privately owned sourcing and audit company based in Chicago. In 2008, we began with category sourcing and then branched out in response to client needs for better card monitoring services. The specialized division known as Card Integrity monitors card transactions and emphasizes card compliance. Better yet, D. Warner Group developed Card Integrity to tackle issues specific to P-Cards as well as travel cards, fuel cards, ghost cards, and out-of-pocket expenses. When D. Warner Group optimized category/expense-sourcing initiatives, the outcome revealed that businesses didn’t always have a good handle on their expense data. So Card Integrity built an in-house expense monitoring system that leverages our company’s internal purchasing, audit, and finance expertise. Today, Card Integrity is a global procurement card expense management service company for firms that generate 500 to five million monthly company card transactions. Headquartered in Chicago, we serve clients in the United States and around the world, in more than 50 countries. Our client base includes (to name just a few) automotive, higher education, domestic, financial, foreign, Fortune 100, government, infrastructure, military, and pharmaceutical companies, both private and public. Card Integrity services are tailored into sector-specific solutions to address our customers’ unique needs and concerns. Why the owl in the logo? Owls represent wisdom, education, and vigilance. So do we. Just as owls use their keen eyes to see minuscule details or to get a bird’s eye view within a forest, Card Integrity uses its solutions to keep watch on the details, intricacies, and trends of your card programs. Similarly, we hunt down any discrepancies and solve any expense data problems along the way. Wisdom, education, and vigilance: these are the traits you want and need from your card expense management service provider. These are the traits you’ll find with Card Integrity. Now it’s time to integrate these traits into your own card programs. 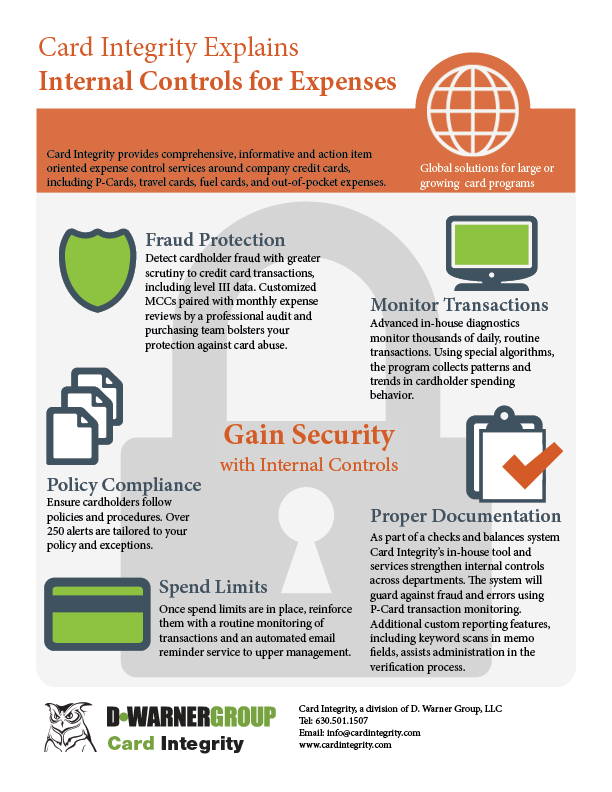 To learn more about Card Integrity, our solutions, and how we can help make your card programs successful, contact us today by email or by calling 630-501-1507. Explore latest insights regarding P-Card usage. Our success is credited to our people. For inquiries or customer requests, reach our support network by email, phone, or website contact form.